Eau de vie, literally water of life, is alcohol as it comes out of the still, clear and full of primary fruit aromas and flavors. What will eventually become cognac, armagnac and calvados is actually eau de vie when it exits the alambic. But normally when one speaks of eau de vie, one speaks of clear fruit brandies that are literally the distilled essence of the fruit from which they are made. Until recently, France had a policy whereby owners of fruit trees were allowed to distill twenty liters of alcohol at 50% alcohol without having to pay tax. Most people living in the country had pear and plum trees whose bounty they would ferment after the harvest, then bring to the town square in the fall where a traveling distiller would pass it through his alambic and convert it into alcohol. This alcohol served as the basis for homemade aperitifs, the preservation of pruneau or as an after dinner digestif. Unfortunately, this tradition is dying as the government now wants the tax revenue from alcohol and is now charging people a rate that makes it less expensive to buy a professionally distilled product at the store than to do it oneself. While the production of eau de vie was once widespread all over France, many of the specialists are now based in Alsace, and this region along the French / German border has become the country's most highly regarded region. This incredibly picturesque region produces great white wines from a series of grand cru vineyards that lie along the foothills of the Vosges mountains. Fruit trees are abundant in the region, and the distillation of stone fruits dates back several centuries. Jean-Paul Metté grew up with distilled pear and kirsch stored in bottles of various sizes around the house. In fact, the village distiller in Ribeauvillé lived just up the road from his parent's house. Jean-Paul would hang out with the old man while he distilled, passing the winter months warmed by the fire of the alambic while slowly learning the art of distillation. He eventually learned what base materials would create the most concentrated, flavorful distillates. In the 1960s, Jean-Paul decided to purchase an alambic and set off on his own. He scoured the Alsacian countryside and contracted the fruit from trees of local farmers. He took care to collect the fruit from the ground in small, wooden boxes and then let them further ripen in the dry, open air. The fruit was fermented with no added sugar or concentrate and fermented only with its natural yeast. In the distillery, Metté felt most comfortable, in front of his alambic as the colorless, aroma-rich eau de vie trickled from the still. "Everything comes alive when you are distilling," he said. "If you don't put your heart and soul into it, the results are worthless." In the early seventies, Jean-Paul had an epiphany: if he could distill mirabelle, poire, raspberry and cherry, why not condense the essences of other elements and put them through the still as well. Here began the distiller's journey that would eventually establish Metté as the most heralded eau de vie producer in the world. Everything was fair game for him: wild strawberry, mullein flower, orange, banana, coffee, rosemary, thyme, pepper, ginger, truffle-even pine needles! Without a son to take over his craft, Metté began passing on the art of distilling to his godson Philippe Traber in 1985. He taught him all the secrets that made every distillery unique. In 1997, Metté's health went into decline and Philippe and his wife Nathalie purchased the distillery to carry on Jean-Paul's work and traditions. Today their spirits are renowned throughout the world, thanks to the extremely wide range of eaux de vie produced and, above all, to their exceptional quality. More than 87 flavors of high quality eaux de vie and 21 liqueurs are available. These are featured prominently in Michelin-starred restaurants throughout Europe and their quality sets the bar for all other producers. The Williams Pear, known in the United States as the Bartlett Pear, is an extremely aromatic variety. The fruit has a traditional bell shape and is considered a summer pear, not as tolerant of cold as some varieties. Optimum conditions for ripening are in dry shady areas; its green skin turns soft yellow and the pulp softens 7 to 10 days after the pear is picked. For the Poire Williams, Metté has worked with the same fruit grower for years in the northern Rhone near Valence. The fruit is picked and stored in small wooden boxes (5 kg maximum) to allow for further ripening. These small cases allow the fruit to mature at the same time. Overly bruised and rotten fruit is discarded. The fruit is crushed and put in fiberglass tanks where its fermentation begins. No sugar or yeast is added and the fermentation proceeds naturally. The sugar and yeast interact during the eight week fermentation that produces an alcohol around 4.5 to 5%. The liquid is racked to remove the fat lees and the dry perry, still on its light lees, is ready for its next transformation. The spirits aged in tank are outside and subject to the vagrancies of the seasons. 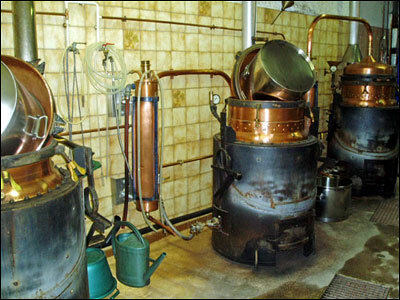 The eau de vie is made in copper Charente-style pot stills that allow double-distillation. The initial distillation is heavily laden with impurities and exits the still around 20% alcohol. The second distillation sees this liquid go through the still again and come out at 70% alcohol, but this time the heads and tails (with volatile esters or heavy fusel oils) are removed, leaving only the heart or purest part of the distillate. 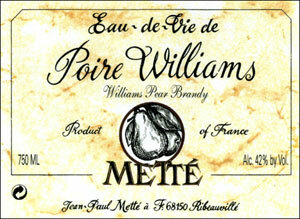 Approximately 11 pounds of pears are required to produce one 375 ml bottle of Metté Poire Williams. After distillation, the eau de vie is put into stainless steel vats where it will rest for the next six to eight years. As the fluctuation in temperature helps improve the quality and complexity of a spirit, the Metté vats are kept outside in an open courtyard and exposed to the chill of snow in the winter and the heat of long summer days. A small opening at the top of the tanks is covered with mesh, allowing the undesirable esters and acids to escape, while the flavor of the fruit further concentrates. The cold also helps the spirit to stabilize naturally. About a year before release, the alcohol content of the spirit is reduced to 45% with the addition of local spring water. The spirit is bottled by hand to order. Not many wild raspberries are available in the Alsace region, so most producers search for them in other parts of Europe. Romania has become the place where many Alsacians source their fruit, and the Metté's contract the production of a small grower in that country. The fresh wild berries are picked and placed in small boxes that are kept stable in larger cases. Shortly after being picked, they are shipped at cool temperatures and in less than 48 hours arrive at the distillery in Ribeauvillé. Instead of fermenting, the whole berries macerate for six days in 75% alcohol eau de vie produced from grapes. This infuses the eau de vie with an intense raspberry flavor. This mixture is then distilled, but because it is already around 30% alcohol, it is distilled in the pot still only once, during which time the heads and the tails are removed. The clear eau de vie exits the still at 70% and goes into the stainless steel tanks where it will rest for the next six to eight years. Like with the Poire Williams, the vats are kept outside in an open courtyard exposed to the chill of snow in the winter and the heat of long summer days. The cold also helps the spirit to stabilize naturally. 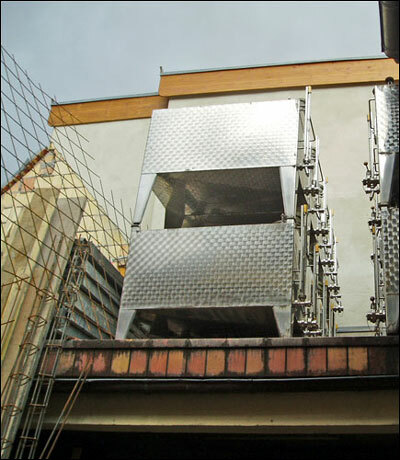 A small opening at the top of the tanks is covered with mesh, allowing the undesirable esters and acids to escape, while the flavor of the fruit further concentrates. About a year before release, the alcohol content of the spirit is reduced to 45% with the gradual addition of local spring water. The spirit is bottled by hand to order.